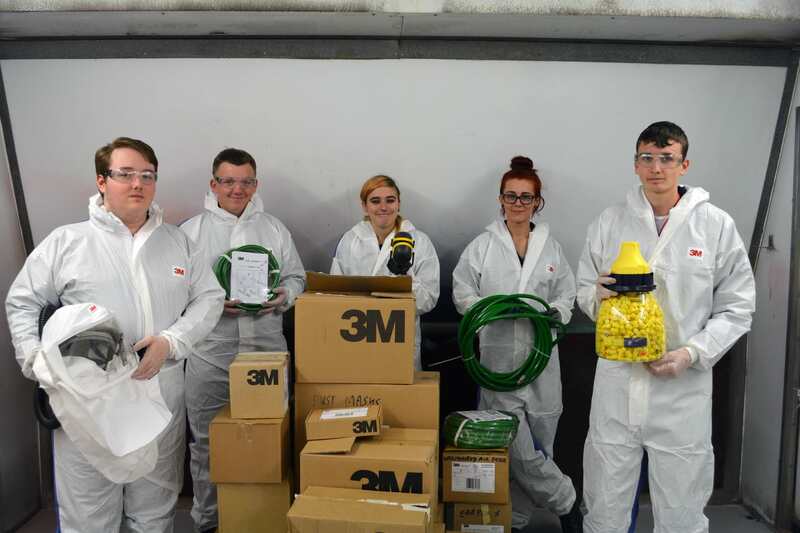 Motor vehicle students have been awarded £5,000 worth of vital personal protective equipment (PPE) by 3M for their efforts in a national safety competition. The science-based technology company has given the prize haul – which included respirators, protective coveralls, ear defenders and air-fed masks – to students at South Essex College’s Basildon Campus, following their award-winning entry to the Learning Occupational Health by Experiencing Risks (LOcHER) Project. Aimed at colleges, the project has been designed to teach students about occupational health and how to communicate the risks to their peers. To win the prize, the students created posters and videos highlighting the risks associated with exposure to paint when spraying cars, as well as what can be done to keep people protected. Not only did their entry win a Safety Groups UK award, the Health and Safety Executive is also using their work as best practice in order to raise awareness of hazards. Jenn Raymond, Senior Marketing Executive at 3M, said: “We at 3M were hugely impressed by the students’ efforts, and are delighted to be donating this vital equipment, which will help ensure their health is protected going forward. Praising the LOcHER project, he added: “It has been invaluable for students to work on a real-life safety campaign in conjunction with a recognised safety group and H&S professionals.